The fly ash produced from burning pulverized coal in a coal-fired boiler is a fine-grained, powdery particulate material that is carried off in the flue gas and usually collected by means of electrostatic precipitators, baghouses, or mechanical collection devices such as cyclones. When pulverized coal is combusted in a dry-ash, dry-bottom boiler, about 80 percent of all the ash leaves the furnace as fly ash entrained in the flue gas. (1) When pulverized coal is combusted in a wet-bottom (or slag-tap) furnace, as much as 50 percent of the ash is retained in the furnace, with the other 50 percent being entrained in the flue gas. In a cyclone furnace, where crushed coal is used as a fuel, 70 to 80 percent of the ash is retained as boiler slag and only 20 to 30 percent leaves the furnace as dry ash in the flue gas. (2) A general flow diagram of fly ash production in a dry-bottom coal-fired utility boiler operation is presented in Figure 1. Figure 1. Production of fly ash in a dry-bottom utility boiler with electrostatic precipitator. In 2006, approximately 29.3 million metric tons (32.4 million tons) of fly ash were used. (3) This is approximately a 5 percent increase in the use of fly ash over the previous year. The majority of this use can be attributed to the production of concrete, concrete products, and grout. Figure 2 shows the 2006 percentages of fly ash use for common construction applications. In general, the specifications used by all states for use of fly ash are provided by the American Society of Testing and Materials (ASTM) or the American Association of State Highway and Transportation Officials (AASHTO) and are listed in Table 1. Although coal-burning electric utility companies produce ash, most utilities make use of commercial ash vendors to sell fly ash. There are approximately 45 commercial ash marketing firms operating throughout the United States in all states except Hawaii. In addition to commercial ash marketing organizations, some coal-burning electric utility companies have formal ash marketing programs. Most coal-burning electric utility companies currently employ an ash management specialist whose responsibility is to monitor ash generation, quality, use, or disposal, and to interface with ash marketers. To identify a fly ash source, contact the local utility company or visit the American Coal Ash Association's web site at the like provided above. Because of variations in coals from different sources, as well as differences in the design of coal-fired boilers, not all fly ash is the same. Although there may be differences in the fly ash from one plant to another, day-to-day variations in the fly ash from a given power plant are usually predictable, provided the plant operation and coal source remain constant. However, there can be a substantial variation in fly ash obtained from burning coal with other fuels (such as natural gas or wood) or with other combustible materials (such as municipal solid waste, scrap tires, etc.). As long as the basic operating parameters at a power plant do not change, fly ash from a known source that is supplied by a reputable ash marketing organization should be a consistent, quality-controlled product. If modifications to a plant have been made, for example low NOx modifications, the subsequent ash should be re-characterized. There are four types, or ranks, of coal, each of which varies in terms of heating value, chemical composition, ash content, and geological origin. These four types are lignite, bituminous, subbituminous, and anthracite. Lignite, also known as brown coal, is the lowest grade coal and has no well defined composition. Burning lignite coal creates a large quantity of ash due to inefficient combustion and high water content. Subbituminous coal has properties between lignite and bituminous coal. Bituminous coal fly ash is principally composed of silica, alumina, iron oxide, and calcium, with varying amounts of carbon, as measured by the loss on ignition (LOI). Subbituminous and lignite coal fly ashes are characterized by higher concentrations of calcium and magnesium oxide and lower percentages of silica and iron oxide, as well as a lower carbon content, compared with bituminous coal fly ash. (8) Anthracite, a form of coal containing few impurities, is not often burned. Thus, there are only small amounts of anthracite coal fly ash. Fly ash to be used in Portland cement concrete (PCC) must meet the requirements of ASTM C618. (9) Two classes of fly ash are defined in ASTM C618: Class F fly ash and Class C fly ash. Fly ash that is produced from burning older, harder anthracite or bituminous coal is typically pozzolanic and is referred to as a Class F fly ash if the ash meets the chemical composition and physical requirements specified in ASTM C618. (5;6) Class F fly ash generally contains less than 10 percent material reported as lime (CaO). (5;10) Although possessing pozzolanic properties, the glassy silica and alumina of Class F fly ash require a cementing agent, such as Portland cement, quicklime, or hydrated lime, with the presence of water to react and produce calcium silicate hydrates (cementitious compounds). Fly ash that is produced from the burning of younger lignite or subbituminous coal, in addition to having pozzolanic properties, also has self-cementing properties (ability to harden and gain strength in the presence of water). (6) When this fly ash meets the chemical composition and physical requirements outlined in ASTM C618, it is referred to as a Class C fly ash. Class C fly ash typically contains between 15 and 35 percent material reported as lime (CaO). (10) Most Class C fly ashes have self-cementing properties. As a consequence of the Clean Air Act, many coal-fired power plants are being equipped with low NOx burners. (11) The short-term effect of burning coal in a low-NOx burner appears to be an increase in the LOI of the fly ash. Changes in the form and quality of unburned carbon in low-NOx fly ash have negatively impacted the use of low-NOx fly ash in concrete. (12) Research investigating all aspects of the low-NOx burning processes is needed to ensure Clean Air regulations are met while at the same time producing coal combustion products that satisfy specifications for use in transportation applications. Fly ash has been used as a cement and mineral admixture in Portland cement concrete (PCC) for nearly 70 years. Approximately 50 percent of recycled fly ash is used in the production of concrete and concrete products, making it the largest single use of fly ash. (3) Fly ash can also be used as a feed material for producing Portland cement and as a component of a Portland-pozzolan blended cement. Fly ash quality must be closely monitored when used in PCC. Fineness, moisture content, LOI, and chemical content are the most important characteristics of fly ash affecting its use in concrete. Fly ash used in concrete must also have sufficient pozzolanic reactivity and must be of consistent quality. When pozzolanic-type Class F fly ash is used, an activator must be added to initiate the pozzolanic reaction. The most commonly used activators or chemical binders in pozzolan-stabilized base (PSB) mixtures are lime and Portland cement, although cement kiln dusts and lime kiln dusts have been used(14;18). Combinations of lime, Portland cement, or kiln dusts have also been used in PSB mixtures. The successful performance of PSB mixtures depends on the development of strength within the matrix formed by the pozzolanic reaction between the fly ash and the activator. This cementitious matrix acts as a binder that holds the aggregate particles together, in a manner similar to a low-strength concrete. Flowable fill is a self-hardening slurry mixture consisting of sand or other fine aggregate material and a cementitious binder that is used as substitute for compacted earth backfill. Fly ash has been used in flowable fill applications as a fine aggregate and (because of its pozzolanic properties) as a supplement to or replacement for the cement. Either pozzolanic or self-cementing fly ash can be used in flowable fill. When large quantities of pozzolanic fly ash are added, the fly ash can act as both fine aggregate and part of the cementitious matrix. Self-cementing fly ash is used in smaller quantities as part of the binder in place of cement. The specific gravity of fly ash usually ranges from 2.1 to 3.0, while its specific surface area (measured by the Blaine air permeability method)(25) may range from 170 to 1000 m2/kg. The chemical properties of fly ash are influenced to a great extent by the chemical content of the coal burned, the air pollution control strategy at the power plant, and the techniques used for handling and storage. Table 2 summarizes the normal range of chemical constituents of fly ashes from bituminous coal, lignite coal, and subbituminous coal. Lignite and subbituminous coal fly ashes have higher calcium oxide content and lower LOI than fly ashes from bituminous coals. Lignite and subbituminous coal fly ashes may have a higher amount of sulfate compounds than bituminous coal fly ashes. The chief difference between Class F and Class C fly ash is the amount of calcium, silica, alumina, and iron percent in the ash. (9) In Class F fly ash, total calcium typically ranges from 1 to 12 percent, mostly in the form of calcium hydroxide, calcium sulfate, and glassy components in combination with silica and alumina. In contrast, Class C fly ash may have reported calcium oxide contents as high as 30 to 40 percent. (26) The amount of alkalis (combined sodium and potassium) and sulfates (SO4) are more abundant in Class C fly ashes than in Class F fly ashes. Table 2. Normal range of chemical composition for fly ash produced from different coal types (expressed as percent by weight). A concern with fly ash use is the possibility of groundwater contamination by trace elements that are associated with coal combustion by-products. The possibility for trace elements to dissolve in rainwater that percolates through fly ash has caused restrictions on fly ash use by state environmental regulations. Five widely used standard leaching tests are outlined in Table 3. A comparison of field to laboratory leachates from fly ash stabilized soil found that column leach tests compare well with field results while water leach tests typically underestimate field concentrations. (32;33) Concentrations in leachate collected from field lysimeters below test sections of fly ash stabilized soil were similar or slightly lower than concentrations measured in column leach tests on the same material. Thus, the column leach test appears to provide a good indication of in field conditions directly below a soil-fly ash mixture provided the test conditions mimic the field conditions. In addition, initial concentration in the field can be conservatively estimated from water leach tests providing scaling factors are applied and the infiltrating water in the field is near neutral. (33) Example results from batch tests and column leaching tests can be found in references 32, 33, and 35. Fly ash can cause a dust problem during storage and processing or through wind erosion during placement in unecapsulated use. Workers involved with dry ash handling can take precautions by requesting Material Safety Data Sheets (MSDS) from fly ash suppliers, by wearing safety goggles to protect their eyes from dust, and by wearing a suitable particulate respirator (i.e., approved by the National Institute for Occupational Safety and Health for particulates). Dust problems can be partially alleviated by compaction and covering of the fly ash, moistening fly ash during placement, and using mechanical ventilation or extraction in areas where dust could escape into the workplace. (10) Special lay-down trucks exist that reduce dusting issues. Finally, due to the variability in fly ash composition between coal plants, industry-wide generalizations about the environmental impact of fly ash cannot be made. Also, because of the variety of leachate testing methods and the variety of standards and regulations to compare these test results to, state regulations should be identified and followed when determining the environmental suitability of fly ash from a particular source. A searchable version of the references used in this section is available here. A searchable bibliography of coal fly ash literature is available here. Horiuchi S, Kawaguchi M, Yasuhara K. Effective use of fly ash slurry as fill material. Journal of Hazardous Materials 2000 9/15;76(2-3):301-37. Steam, its generation and use. 39th ed. New York: Babcock & Wilcox; 1978. American Coal Ash Association (ACAA). 2006 coal combustion product (CCP) production and use. Aurora, CO: American Coal Ash Association; August, 2007. Federal Highway Administration (FHWA), American Coal Ash Association (ACAA). Fly ash facts for highway engineers. Federal Highway Administration (FHWA); 2003 06-13-2003. FHWA-IF-03-019. Kalinski ME, Hippley BT. The effect of water content and cement content on the strength of Portland cement-stabilized compacted fly ash. Fuel 2005 10;84(14-15):1812-9. Kalinski ME, Yerra PK. Hydraulic conductivity of compacted cement–stabilized fly ash. Fuel 2006 11;85(16):2330-6. Dockter BA, Jagiella DM. Engineering and environmental specifications of state agencies for utilization and disposal of coal combustion products. In: 2005 world of coal ash conference, Lexington, KY. ; 2005. Meyers JF, Pichumani R, Kapples BS. Fly ash: A highway construction material. Washington, DC: Federal Highway Administration (FHWA); 1976. FHWA-IP-76-16. ASTM C618-05 standard specification for fly ash and raw or calcined natural pozzolan for use as mineral admixture in Portland cement concrete. In: Annual book of ASTM standards. West Conshohocken, Pennsylvania: ASTM; 2005. Environmental Protection Agency (EPA), Federal Highway Administration (FHWA). Using coal ash in highway construction - A guide to benefits and impacts. ; April 2005. Report nr EPA-530-K-002:ID: 151. Jobs Through Recycling [Internet]; c2007 [cited 2007 11/29]. Available from: http://www.epa.gov/jtr/comm/cfa.asp. Fox JM, Constantiner D. The influence of fly ash after change to low-NOx burners on concrete strength, case study. In: 2007 world of coal ash (WOCA), may 7-10, Covington, Kentucky. ; 2007. AASHTO. Standard specification for mineral filler for bituminous paving mixtures. Washington, DC 20001: American Association of State Highway and Transportation Officials; 2007. M 17-07. Arora S, Aydilek AH. Class F fly-ash-amended soils as highway base materials. J Mater Civ Eng 2005;17:640-9. Bin-Shafique MS, Edil TB, Benson CH, Senol A. Incorporating a fly-ash stabilized layer into pavement design. Proceedings of the Institution of Civil Engineers: Geotechnical Engineering 2004;157:239-49. Edil TB, Benson CH, Bin-Shafique MS, Tanyu B, Kim W, Senol A. Field evaluation of construction alternatives for roadway over soft subgrade. Transp Res Rec 2000;1786:36-48. Wen H, Tharaniyil MP, Ramme BW, Krebs S. Field performance evaluation of class C fly ash in full-depth reclamation: Case history study. Transp Res Rec 2004(186):41-6. White DJ, Bergeson K. Long-term strength and durability of hydrated fly-ash road bases. Transportation Research Record 2001;1755(1):151-9. Senol A, Edil TB, Bin-Shafique MS, Acosta HA, Benson CH. Soft subgrades’ stabilization by using various fly ashes. Resources, Conservation and Recycling 2006 4;46(4):365-76. Edil TB, Acosta HA, Benson CH. Stabilizing soft fine-grained soils with fly ash. J Mater Civ Eng 2006;18:283-94. Edil TB, Benson CH. Sustainable construction case history: Fly ash stabilization of road-surface gravel. In: Proceedings of the 2007 world of coal ash (WOCA), May 7-10, Covington, Kentucky. ; 2007. Di Gioia AM, Nuzzo WL. Fly ash as structural fill. Journal of the Power Division 1972 June;98(1):77-92. Kim B, Prezzi M, Salgado R. Geotechnical properties of fly and bottom ash mixtures for use in highway embankments. Journal of Geotechnical and Geoenvironmental Engineering 2005;131(7):914-24. AASHTO. Soundness of aggregate by use of sodium sulfate or magnesium sulfate, part II tests. Washington, DC 20001: American Association of State Highway and Transportation Officials; 1999. Report nr T104-99. ASTM C204-07 standard test methods for fineness of hydraulic cement by air-permeability apparatus. In: West Conshohocken, Pennsylvania: ASTM; 2007. McKerall WC, Ledbetter WB, Teague DJ. Analysis of fly ashes produced in Texas. Texas A&M University, College Station, Texas: Texas Transportation Institute,; 1982. No. 240-1. Environmental Protection Agency (EPA). Report to congress: Wastes from the combustion of fossil fuels – volume II. ; 1999. Report nr EPA 530-S-99-010. Electric Power Research Institute (EPRI). High-volume fly ash utilization projects in the United States and Canada. Palo Alto, California: Electric Power Research Institute (EPRI); 1998. Report nr EPRI CS-4446. Hassett DJ, Heebink LV. Release of mercury vapor from coal combustion ash. In: 2001 international ash utilization symposium, Lexington, KY. ; 2001. Pflughoseft-Hassett DF, Hassett DJ, Dockter BA. High volume fly ash utilization and the effects on groundwater in North Dakota in high-volume Uses/Concrete applications. In: Proceedings of the 10th international ash use symposium, Orlando FL. 1993. Environmental Protection Agency (EPA). Notice of regulatory determination on four large-volume wastes from the combustion of coal by electric utility power plants. EPA; 1993. Report nr Federal Register Notice 58 FR 42466. Bin-Shafique MS, Benson CH, Edil TB. Geoenvironmental assessment of fly ash stabilized subbases. University of Wisconsin – Madison, Madison, Wisconsin: Geo Engineering Department of Civil and Environmental Engineering; 2002 March 11, 2002. Report nr Geo Engineering Report No. 02-03. Bin-Shafique MS, Benson CH, Edil TB, Hwang K. Leachate concentrations from water leach and column leach tests on fly ash-stabilized soils. Environ Eng Sci 2006;23:53-67. Kanungo SB, Mohapatra R. Leaching behavior of various trace metals in aqueous media from two fly ash samples. J Environ Qual 2000;29:188-96. Ghosh A, Sobbarao C. Hydraulic conductivity and leachate characteristics of stabilized fly ash, Journal of Environmental Engineering 1998;24(9):812-20. Mohanty S, Chugh Y. Post construction environmental monitoring of a fly ash-based road subbase. Practice Periodical on Structural Design and Construction 2006;11(4):238-46. Sauer JJ, Benson CH, Edil TB. Metals leaching from highway test sections constructed with industrial byproducts. Madison, Wisconsin: Department of Civil and Environmental Engineering, University of Wisconsin-Madison; 2005 December 27, 2005. Geo Engineering Report No. 05-21. Bin-Shafique MS, Benson CH, Edil TB. Leaching of heavy metals from fly ash stabilized soils used in highway pavements. Madison, WI: Geo Engineering Program, University of Wisconsin-Madison; 2002. Report nr 02-14. Harrington-Hughes K. Primer environmental impact of construction and repair materials on surface and ground waters. Transportation Research Board, National Research Council, Washington, D.C. National Cooperative Highway Research Program; 2000. NCHRP Report 443. Friend M, Bloom P, Halbach T, Grosenheider K, Johnson M. Screening tool for using waste materials in paving projects (STUWMPP). Office of Research Services, Minnesota Dept. of Transportation, Minnesota; 2004. Report nr MN/RC–2005-03. Hesse TE, Quigley MM, Huber WC. User’s guide: IMPACT—A software program for assessing the environmental impact of road construction and repair materials on surface and ground water. NCHRP; 2000. NCHRP 25-09. Simunek J, Sejna M, van Genuchten, M. T. The HYDRUS-2D software package for simulating the two-dimensional movement of water, heat, and multiple solutes in variably-saturated media. Golden, Colorado: International Ground Water Modeling Center; 1999. Report nr IGWMC - TPS - 53. Apul D, Gardner K, Eighmy T, Linder E, Frizzell T, Roberson R. Probabilistic modeling of one-dimensional water movement and leaching from highway embankments containing secondary materials. Environmental Engineering Science 2005;22(2):156–169. Li L, Benson CH, Edil TB, Hatipoglu B. Groundwater impacts from coal ash in highways. November 2006;159(WR4):151-63. Environmental Protection Agency (EPA). Industrial waste management evaluation model (IWEM) User’s guide. Washington, DC: US EPA; 2002. Report nr EPA530-R-02-013. Melton JS, Gardner KH, Hall G. Use of EPA’s industrial waste management evaluation model (IWEM) to support beneficial use determinations. U.S. EPA Office of Solid Waste and Emergency Response (OSWER); 2006. Guide for Industrial Waste Management [Internet]; c2006. Available from: http://www.epa.gov/epaoswer/non-hw/industd/guide/index.asp. Fly ash can also be used as an asphalt cement extender. Testing has shown 10 and 30 percent replacement of asphalt cement with fly ash does not significantly negatively affect mix properties like strength and durability. (5) Because of the difference in unit weight between asphalt cement and fly ash, the partial replacement of asphalt cement with fly ash increases the amount of binder, which counterbalances the decrease in the percentage of the asphalt cement. (2) Replacement of a portion of asphalt cement with fly ash in paving mixtures could provide an economical alternative to using costly asphalt as well as provide longer pavement service life due to improved pavement properties. (5) Although testing has shown the possible benefits of this application, further testing, especially in the field, is required to prove the legitimacy using fly ash as a partial asphalt cement replacement. Fly ash must be in a dry form when used as a mineral filler. This means that moisture-conditioned fly ash and reclaimed ponded fly ash are unsuitable for use in asphalt concrete. Fly ash is collected at the power plant and stored in watertight silos in a dry form. As a result, fly ash can readily be loaded into pneumatic trucks and delivered to a hot mix asphalt plant. The physical requirements for mineral filler in bituminous paving mixtures are defined in AASHTO M-17 and are shown in Table 4. (3;14) These requirements include gradation, organic impurities, and plasticity characteristics. Other properties of interest include fineness and specific gravity. Table 4. AASHTO M-17 specification requirements for mineral filler use in asphalt paving mixtures. Fineness: Although most sources of fly ash are capable of meeting the AASHTO gradation requirements for mineral filler, consistency of gradation is important, especially the size and shape of the particles finer than a 0.075 mm (No. 200) sieve. Theoretically, higher fineness may indicate a more effective mineral filler, although the higher fineness also means a greater surface area of particles that must be coated, resulting in an increase in asphalt content of the mix. Fly ash fineness is often specified by the percentage by weight retained on the 0.045 mm (No. 325) sieve, especially when used in Portland cement concrete;(16) however, this is not a standard for fly ash used as a mineral filler. Specific Gravity: The specific gravity of fly ash varies from source to source. Specific gravity may be as low as 1.7 to as high as 3.0, but is more often within a range of 2.0 to 2.8. Most conventional mineral fillers have a specific gravity in the 2.6 to 2.8 range. The bulk unit weight of fly ash is typically less than conventional mineral filler; therefore, a given weight percentage of fly ash will usually occupy a greater volume than that of a conventional filler material. Plasticity: Fly ash is a nonplastic material. Thus, plasticity is not an issue when using fly ash as a mineral filler. The same mix design methods that are commonly used for hot mix asphalt paving mixtures are also applicable to mixes in which coal fly ash is used as a mineral filler. The percentage of fly ash filler to be incorporated into the design mix is the lowest percentage that will enable the mix to satisfy all the required design criteria. A small amount of hydrated lime (usually ½ to 2 percent by weight) improves the anti-stripping characteristics of an asphalt paving mix. Because Class C fly ash contains 30 percent or more calcium, the use of Class C fly ash may improve asphalt stripping. In addition, fly ash is hydrophobic in nature and is believed to reduce asphalt stripping,(3) although further testing is needed to confirm that fly ash improves asphalt stripping characteristics. Conventional AASHTO pavement structural design methods are applicable to hot mix asphalt incorporating fly ash as mineral filler in the mix. Fly ash can be a dusty material and may result in more dust generation than normally experienced with conventional mineral fillers. At a hot mix plant, the fly ash can be discharged directly into a storage silo, like conventional mineral fillers, prior to input into the mixing plant. Typical placement and compacting equipment can be used with asphalt mixes containing fly ash. Churchill EV, Amirkhanian SN. Coal ash utilization in asphalt concrete mixtures. J Mater Civ Eng 1999;11:295-301. Butul B. Performance characteristics of coal fly ash and wood ash-modified asphalt binder. United States -- Florida: Florida Atlantic University; 2000:ID: 192. Federal Highway Administration (FHWA), American Coal Ash Association (ACAA). Fly ash facts for highway engineers. Federal Highway Administration (FHWA); 2003 06-13-2003. Report nr FHWA-IF-03-019. Kandhal PS, Lynn CY, Parker F. Characterization tests for mineral fillers related to performance of asphalt paving mixtures. Transportation Research Record 1998;1638:101-10. Simms SA. Use of coal fly ash in asphalt concrete mixes. Canada: DalTech - Dalhousie University (Canada); 1998:ID: 190.
Zimmer FV. Fly ash as a bituminous filler. In: Proceedings of the second ash utilization symposium. Pittsburgh, Pennsylvania: U.S. Bureau of Mines; 1970. ASTM D1075-07 standard test method for effect of water on compressive strength of compacted bituminous mixtures. In: Annual Book of ASTM Standards, West Conshohocken, Pennsylvania: ASTM; 2007. Brahma SP. Use of lignite fly ash as a mineral filler in bituminous concrete. Fargo, North Dakota: North Dakota State University, Engineering Experiment Station; 1968. Report nr Series No. 3. Carpenter CA. Cooperative study of fillers in asphaltic concrete. Public Roads 1952;27:101-10. Rosner JC, Chehovits JG, Morris GR. Fly Ash as a Mineral Filler and Anti-Strip Agent For Asphalt Concrete. Challenge of change - 6th international ash utilization symposium proceedings. Reno, NV, United States Department of Energy, Morgantown Energy Technology Center. Galloway BM. A review of the use of mineral filler in asphalt-aggregate mixtures. Fly ash applications in 1980 conference; 1980. American Coal Ash Association (ACAA). 2006 coal combustion product (CCP) production and use. Aurora, CO: American Coal Ash Association; August 24, 2007. AASHTO. Use of waste materials in highway construction. subcommittee on construction. Washington, DC: American Association of State Highway and Transportation Officials; August, 1994. AASHTO. Standard specification for mineral filler for bituminous paving mixtures. Washington, DC 20001: American Association of State Highway and Transportation Officials; 2007. Report nr M 17-07. ASTM C618-05 standard specification for fly ash and raw or calcined natural pozzolan for use as mineral admixture in Portland cement concrete. In: Annual book of ASTM standards. ASTM; West Conshohocken, Pennsylvania: 2005. By 2010, the net cement production in the world is expected to be nearly two billion metric tons (2.2 billion tons), emitting two billion metric tons of carbon dioxide annually. (1) The replacement of fly ash for Portland cement is therefore one way to reduce greenhouse gas emissions while also advancing sustainable development. ASTM C618 defines two classes of fly ash for use in concrete: 1) low-calcium or Class F fly ash, usually derived from the burning of anthracite or bituminous coal, and 2) high-calcium or Class C fly ash, usually derived from the burning of lignite or subbituminous coal. (3;4) ASTM C618 also delineates requirements for the physical, chemical, and mechanical properties for these two classes of fly ash. Class F fly ash is pozzolanic, with little or no cementing value alone. Class C fly ash has self-cementing properties as well as pozzolanic properties. The main precautions associated with the use of fly ash in concrete can include slower early strength development, extended initial setting time, difficulty in controlling air content, seasonal limitations during winter months, and quality control of fly ash sources. (5) The use of Class F fly ash usually results in slower early strength development, but the use of Class C fly ash does not and may enhance early strength development. Ash that is handled and stored using a wet system. When fly ash is used in blended cement or as a partial replacement for Portland cement in ready-mix concrete, the ash must be in a dry form and requires no processing. When used as a raw feed material for the production of Portland cement, either dry or conditioned ash can be used. Fly ash used in concrete should be as consistent and uniform as possible. The fly ash should be monitored by a quality assurance/quality control (QA/QC) program that complies with the recommended procedures in ASTM C311. (8) These procedures establish standards for methods of sampling and frequency of performing tests for fineness, loss on ignition (LOI), specific gravity, and pozzolanic activity such that the consistency of a fly ash source can be certified. Many state transportation agencies, through their own program of sampling and testing, have been able to prequalify sources of fly ash within their own state (or from nearby states) for acceptance in ready-mixed concrete. Prequalification of fly ashes from different sources provides an agency with a certain level of confidence in the event fly ashes from different sources are to be used in the same project. Some of the engineering properties of fly ash that are of particular interest when fly ash is used as an admixture or a cement addition to PCC mixes include fineness, LOI, chemical composition, moisture content, and pozzolanic activity. Most specifying agencies refer to ASTM C618(3) when citing acceptance criteria for the use of fly ash in concrete. Pozzolanic Activity (Chemical Composition and Mineralogy): Pozzolanic activity refers to the ability of the silica and alumina components of fly ash to react with available calcium and/or magnesium from the hydration products of Portland cement. ASTM C618 requires that the pozzolanic activity index with Portland cement, as determined in accordance with ASTM C311(8), be a minimum of 75 percent of the average 28-day compressive strength of control mixes made with Portland cement. Loss on Ignition: Many state transportation departments specify a maximum LOI value that does not exceed 3 or 4 percent, although ASTM criteria allow a maximum LOI content of 6 percent. (3) This is because carbon contents (reflected by LOI) higher than 3 to 4 percent have an adverse effect on air entrainment. Fly ashes must have a low enough LOI (usually less than 3.0 percent) to satisfy ready-mix concrete producers that are concerned about product quality and the control of air-entraining admixtures. Furthermore, consistent LOI values are almost as important as low LOI values to ready-mix producers that strive for consistent and predictable quality. Moisture Content: ASTM C618 specifies a maximum allowable moisture content of 3.0 percent. Strength Development: Previous studies of fly ash concrete mixes have generally confirmed that most mixes that contain Class F fly ash that replaces Portland cement at a 1:1 (equal weight) ratio gain compressive strength, as well as tensile strength, more slowly than conventional concrete mixes for as long as 60 to 90 days. Beyond 60 to 90 days, Class F fly ash concrete mixes will ultimately exceed the strength of conventional PCC mixes. (5) For mixes with replacement ratios from 1:1 to 1.5:1 by weight of Class F fly ash to the Portland cement that is being replaced, 28-day strength development is approximately equal to that of conventional concrete. Heat of Hydration: The initial impetus for using fly ash in concrete stemmed from the fact that the more slowly reacting fly ash generates less heat per unit of time than the hydration of the faster reacting Portland cement. Thus, the temperature rise in large masses of concrete (such as dams) can be significantly reduced if fly ash is substituted for cement, since more of the heat can be dissipated as it develops. Not only is the risk of thermal cracking reduced, but greater ultimate strength is attained in concrete with fly ash because of the pozzolanic reaction. (10) Class F fly ashes are generally more effective than Class C fly ashes in reducing the heat of hydration. Hydraulic conductivity: Fly ash reacting with available lime and alkalies generates additional cementitious compounds that act to block bleed channels, filling pore space, and reducing the hydraulic conductivity of hardened concrete. (13) The pozzolanic reaction consumes calcium hydroxide (Ca(OH)2), which is leachable, replacing it with insoluble calcium silicate hydrates (CSH). (10) The increased volume of fines and reduced water content also play a role in reducing hydraulic conductivity. Resistance to Freeze-Thaw: As with all concretes, the resistance of fly ash concrete to damage from freezing and thawing depends on the adequacy of the air void system, as well as other factors, such as strength development, climate, and the use of deicer salts. Special attention must be given to attaining the proper amount of entrained air and air void distribution because fly ash may reduce the effectiveness of air entraining agents. (14) Once fly ash concrete has developed adequate strength, no significant differences in concrete durability have usually been observed. (10) There should be no more tendency for fly ash concrete to scale in freezing and thawing exposures than conventional concrete, provided the fly ash concrete has achieved its design strength and has the proper air void system. Fly ash, especially Class F fly ash, is effective in three ways in substantially reducing alkali-silica expansion: 1) fly ash produces a denser, less permeable concrete, 2) when used as a cement replacement fly ash reduces total alkali content by reducing the Portland cement; and 3) alkalis react with fly ash instead of reactive silica aggregates. Class F fly ashes are probably more effective than Class C fly ashes because of higher silica content, which can react with alkalis. Users of Class C fly ash are encouraged to evaluate the long-term volume stability of concrete mixes in the laboratory prior to field use, with ASTM C441(20) as a suggested method of test. 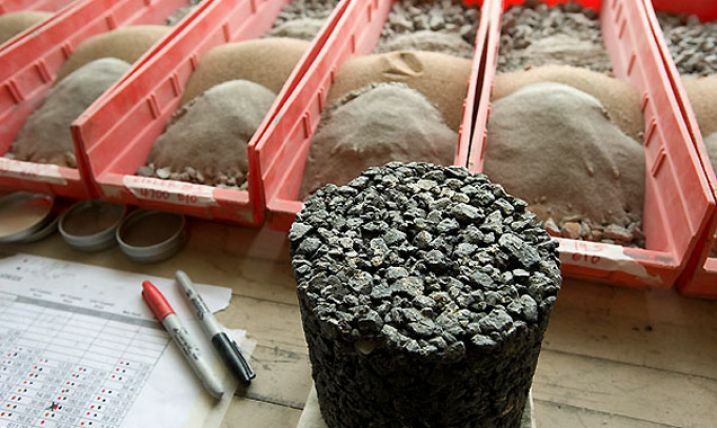 One mix design approach used in proportioning fly ash concrete is to design a mix with all Portland cement, remove a portion of the Portland cement, and then add fly ash to compensate for the cement removed. Class C fly ash is typically substituted at a 1:1 ratio, while Class F fly ash may also be substituted at a 1:1 ratio, but is sometimes specified at a 1.25:1 to 1.5:1 ratio. (5) Some states require that for certain mixes, fly ash be added to a mix without a reduction in cement content. When Type IP (Portland-pozzolan) or Type I-PM blended (Pozzolan modified Portland) cement is used in a concrete mix, fly ash is already part of the cementing material; therefore, there it is recommended not to add additional fly ash. The blended cement can be used in the mix design process in the same way as a Type I Portland cement. To select a mix proportion that satisfies the design requirements for a particular project, trial mixes must be made. In a concrete mix design, the water-cement (w/c) ratio is a key design parameter, typically ranging from 0.37 to 0.50. When using a blended cement, the water demand typically is reduced because of the presence of fly ash. When fly ash is used as a separately batched material, trial mixes should be made using a water-cement plus fly ash (w/c+f) ratio, sometimes referred to as the water-cementitious ratio. The design of any fly ash concrete mix is based on proportioning the mix at varying water-cementitious ratios to meet or exceed requirements for compressive strength (at various ages), entrained air content, and slump or workability needs. The mix design procedures stipulated in ACI 211.1 provide a step-by-step process regarding trial mix proportioning of the water, cement (or cement plus fly ash), and aggregate materials. However, fly ash has a lower specific gravity than Portland cement, which should be taken into consideration in the mix proportioning process. When fly ash is used as a mineral admixture, the ready-mix producer typically handles fly ash in the same manner as Portland cement, except that fly ash must be stored in a separate silo from the Portland cement. Placement and handling of fly ash concrete is similar to that of normal concrete. Fly ash concrete using Class F fly ash has a slower setting time than normal concrete. As a result, finishing operations may have to be delayed, possibly by 1 to 2 hours, depending on the temperature. Also, fly ash concrete surfaces may tend to be more sticky than normal concrete during placement and finishing, although properly proportioned concrete mixes containing fly ash should improve workability and finishing. (5) Normal procedures for screeding, finishing, edging, and jointing of conventional PCC are also applicable to fly ash concrete. Construction should be scheduling to allow adequate time for strength gain prior to: traffic loads, freeze-thaw cycles, or the application of deicing salts. Some states have a construction cut-off date beyond which fly ash is not permitted to be used in concrete until the following spring. There is less of a concern with the use of Class C fly ash in cold weather than Class F fly ash. The most important quality control consideration concerning the use of fly ash in PCC mixes is to ensure that the air content of the freshly mixed concrete is within specified limits. Air content testing of fly ash concrete mixes may need to be performed at a greater frequency than with normal PCC mixes. Another quality control consideration in freshly mixed PCC is workability, as determined by slump tests. Slump testing of fly ash concrete should be done at the same frequency as for normal PCC mixes. Bilodeau A, Malhotra VM. High-volume fly ash system: Concrete solution for sustainable development. ACI Mater J 2000;97:41-8. ASTM C595-07 standard specification for blended hydraulic. In: Annual book of ASTM standards. ASTM, West Conshohocken, Pennsylvania; 2005. ASTM C618-05 standard specification for fly ash and raw or calcined natural pozzolan for use as mineral admixture in Portland cement concrete. In: Annual book of ASTM standards. ASTM, West Conshohocken, Pennsylvania: 2005. Papadakis VG. Effect of fly ash on Portland cement systems: Part I. low-calcium fly ash. Cem Concr Res 1999;29(1):1727-36. Federal Highway Administration (FHWA), American Coal Ash Association (ACAA). Fly ash facts for highway engineers. Federal Highway Administration (FHWA); 2003 Report nr FHWA-IF-03-019. Collins RJ, Ciesielski SK. Recycling and use of waste materials and by-products in highway construction. National Cooperative Highway Research Program Synthesis of Highway Practice 199, Transportation Research Board; Washington, DC: 1994. ASTM C311-05 standard test methods for sampling and testing fly ash or natural pozzolans for use in portland-cement concrete. In: Annual book of ASTM standards. ASTM, West Conshohocken, Pennsylvania: 2005. ASTM C204-07 standard test methods for fineness of hydraulic cement by air-permeability apparatus. In: Annual book of ASTM standards, ASTM, West Conshohocken, Pennsylvania: 2007. Halstead WJ. Use of fly ash in concrete. Transportation Research Board; Washington, D.C.: 1986. Cook JE. A ready-mixed concrete company's experience with class C ash. National Ready-Mix Concrete Association; Silver Spring, Maryland: 1981. Report nr 163. ACI 211.4R. ACI 211.4R guide for selecting proportions for high-strength concrete with Portland cement and fly ash. ; 1993. Report nr ACI 211.4R. Meyers JF, Pichumani R, Kapples BS. Fly ash: A highway construction material. Washington, DC: Federal Highway Administration (FHWA); 1976. Report nr FHWA-IP-76-16. Freeman E, Gao Y, Hurt R, Suuberg E. Interactions of carbon-containing fly ash with commercial air-entraining admixtures for concrete. Fuel 1997 6;76(8):761-5. Hester JA. Fly ash in roadway construction. First ash utilization symposium, U.S. Bureau of Mines, Washington, D.C.:; 1967. Jia X, Zhou S. Effect of low-calcium fly ash on the resistance of cement mortar to sulfate attack in the form of acid rain. Key Engineering Materials 2006;302-303:84-90. Dunstan ER,Jr. A possible method for identifying fly ashes that will improve sulfate resistance of concrete. Cement, Concrete and Aggregates 1980;2(1). Helmuth R. Fly ash in cement and concrete. Skokie, Illinois: Portland Cement Association; 1987. Report nr SP040.01T. Chang-Seon S, Shondeep LS, Zollinger DG. Application of modified ASTM C1260 test for fly ash-cement mixtures, Transportation Research Record [Internet]. [revised 2003;1834. ASTM C441-05 standard test method for effectiveness of pozzolans or ground blast-furnace slag in preventing excessive expansion of concrete due to the alkali-silica reaction. In: Annual book of ASTM standards. ASTM, West Conshohocken, Pennsylvania: 2005. ACI 211.1. ACI 211.1 standard practice for selecting proportions for normal, heavyweight, and mass concrete. American Concrete Institute; Detroit, Michigan: 2002. ASTM C39/C39M-05e1 standard test method for compressive strength of cylindrical concrete specimens. In: Annual book of ASTM standards. ASTM, West Conshohocken, Pennsylvania; 2005. Hani N, Nakin S. Effect of curing methods on durability of high-performance concrete. Transportation Research Record 2002;1798. Portland Cement Association (PCA). Cold-weather concreting. Portland Cement Association Skokie, Illinois: 1980. Report nr IS154.06T. According to the American Coal Ash Association, structural fill or embankment material is the second largest use of fly ash after concrete production. (1) Nearly all of the fly ash used for embankment construction is anthracite or bituminous coal fly ash. Lignite or subbituminous fly ashes, which are usually self-cementing, can harden prematurely when moisture is added, resulting in handling problems and an inability to achieve the required degree of compaction. Fly ash use as a structural fill or embankment material was pioneered during the 1950s in Great Britain as an alternate borrow material on roadway fill projects. Fly ash has been used to construct or repair embankments since 1970. (3) When used in structural fills or embankments, fly ash offers several advantages over natural soil or rock. The relatively low unit weight of fly ash makes it well suited for placement over soft or low bearing strength soils. The high shear strength results in good bearing support and minimal settlement. The ease with which fly ash can be placed and compacted at the proper moisture contents, can reduce construction time and equipment costs. In areas where fly ash is readily available in bulk quantities, the cost of fly ash can be less expensive than borrow soil. Fly ash for embankment construction should be delivered to the job site within 3 to 4 percent of its optimum moisture content, preferably on the dry side of optimum. (4) A moisture content 1 or 2 percent above optimum can make fly as difficult to compact. (6) Dry fly ash from a silo must be water conditioned to the desired moisture content. 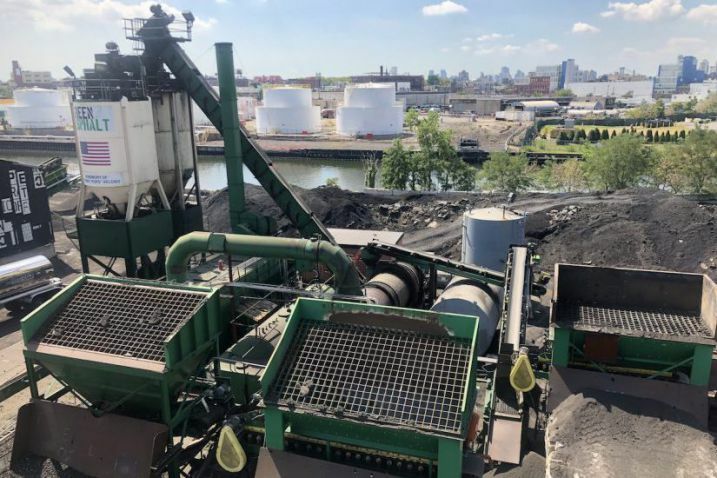 Conditioned fly ash from a landfill should be excavated from the landfill, stockpiled, and additional water added, if needed, prior to delivery. Ponded fly ash must be removed from a lagoon, stockpiled until the moisture content has been sufficiently reduced for placement and then delivered to the job site. Since most lignite or subbituminous fly ashes are self-cementing, the addition of moisture in amounts approaching the optimum moisture content may result in flash setting or sudden hardening of the ash. To prepare this type of fly ash for use as embankment material, the ash may need to be lightly conditioned with water (10 to 15 percent), stockpiled for several weeks, and passed through a crusher to remove agglomerations prior to its use as fill. Additional water, if needed, should be added only after the lignite or subbituminous fly ash has been placed and just prior to compaction. Engineering properties of fly ash that are of particular interest when fly ash is used as an embankment or fill material are moisture density relationship (compaction curve), particle size distribution, shear strength, consolidation characteristics, bearing strength, and hydraulic conductivity. Moisture-Density Relationship: Fly ash has a relatively low compacted density, thereby reducing the applied loading and settlement of the supporting subgrade. Conditioned fly ash tailgated over the slope of an embankment can have a loose dry density as low as 6.3 to 7.9 kN/m3 (40 to 50 lb/ft3). However, when well compacted at optimum moisture content (usually between 20 and 35 percent), the dry unit weight of fly ash may be greater than 13.4 kN/m3 (85 lb/ft3), as high as 15.7 kN/m3 (100 lb/ft3). Particle Size Distribution: Fly ash is predominantly a silt-sized nonplastic material. Between 60 and 90 percent of fly ash particles are finer than a 0.075 mm (No. 200) sieve. As such, fly ash can be considered to be frost-susceptible. (7) The potential reduction in strength from freeze-thaw cycles is a concern. Laboratory test results show that unconfined compressive strength of compacted fly ash was not affected by freeze-thaw cycles, because the degree of saturation was not 100 percent, which allowed for volumetric expansion of freezing water to occur without affecting the fly ash strength. (8) Therefore, fly ash fills should be free draining. Shear Strength: The shear strength of freshly compacted fly ash samples is primarily from internal friction, although some apparent cohesion has been observed in bituminous (pozzolanic) fly ashes. (9) The shear strength of fly ash is affected by the density and moisture content with maximum shear strength occurring at optimum moisture content. (10) Bituminous fly ash has a friction angle that is usually in the range of 26° to 42°. A test program involving shear strength testing for 51 different ash samples resulted in a mean friction angle of 34°, and a standard deviation of 3.3°. (10)Therefore, a friction angle of 30° would be a reasonable estimate for design. Consolidation Characteristics: An embankment or structural backfill should possess low compressibility to minimize roadway settlements or differential settlements between structures and adjacent approaches. Consolidation has been shown to occur more rapidly in compacted fly ash than fine-grained soil because fly ash has a higher void ratio and greater hydraulic conductivity than most fine-grained soils. For fly ashes with age-hardening properties, including most Class C fly ashes, the magnitude of the compressibility is reduced. Bearing Strength: California bearing ratios (CBR) for Class F fly ash from the burning of anthracite or bituminous coals have been found to be similar to fine grained soil, 5 to 15 percent. For naturally occurring soils, CBR values normally range from 3 to 15 percent for fine-grained materials (silts and clays), from 5 to 40 percent for sand and sandy soils, and from 20 to 100 percent for gravels and gravelly soils. Hydraulic conductivity: The hydraulic conductivity of well-compacted fly ash ranges from 10-4 to 10-6 cm/s, which is roughly equivalent to the hydraulic conductivity of a silty sand to silty clay soil. The hydraulic conductivity of fly ash is affected by the degree of compaction, grain size distribution, and internal pore structure. Since fly ash consists almost entirely of spherical shaped particles, the particles are able to be densely packed during compaction, resulting in comparatively low hydraulic conductivity that minimizes the seepage of water through a fly ash embankment. To determine a safe design slope, slope stability analysis of a design cross-section of the fly ash embankment must be performed. The basic principle of slope stability analysis is to compare the factors contributing to instability with those resisting failure. The principal resistance to failure is the shear strength of the embankment material. A long term and seismic slope stability analysis should be preformed. For long-term stability of fly ash embankments, a factor of safety of 1.5 against slope instability is recommended, while for seismic loadings a factor of safety of 1.2 is recommended. (12) Unless the fly ash is self-hardening, the cohesion (c) value should be zero for these calculations. Reference 13 provides state-of-the-art guidance on slope-stability analysis. Erodibility of compacted fly ash is affected by the slope angle. Slopes should be protected as soon as possible after attaining final grade to minimize erosion by runoff or even high winds. One way to prevent such erosion is to construct a fly ash embankment within dikes of granular soil, which serve to protect the slopes throughout construction. Another way is to cover the slopes with topsoil as the embankment is being constructed. Overfilling slopes and trimming excess fly ash back to the appropriate grade once the final height is achieved is another approach. Finally, short-term erosion control may be accomplished by stabilizing the surface fly ash on the slopes with a low percentage of Portland cement or lime,(14) or covering with a blanket of coarse bottom ash. During times of heavy or prolonged precipitation, the delivered moisture content of the fly ash may have to be reduced to compensate for the effects of the precipitation. Fly ash, unlike most soils, can be compacted in the winter, although spreading and compacting fly ash when the ambient air temperature is below -4°C (25°F) is not recommended. (14) In addition, placing frozen fly ash is also not recommended. Because fly ash obtained directly from silos or hoppers dissipates heat slowly, fly ash may be placed during cold weather. If frost does penetrate into the top surface of the fly ash, the ash can be removed from the surface by a bulldozer, or recompacted after thawing and drying. (12) Construction should be suspended during severe weather conditions, such as heavy rainfall, snowstorms, or prolonged and/or excessively cold temperatures. Strength reduction of fly ash during periods of cyclic freezing and thawing may occur. (8) The frost susceptibility of fly ash can be measured according to ASTM D5918. (17) This test method applies two freeze-thaw cycles to a compacted specimen 146 mm (5.75 in) in diameter and 150 mm (6 in) in height. The heave rate and California bearing ratio (CBR) after thaw give an indication of frost susceptibility. Frost susceptible materials have a heave rate greater than 4 mm/day and a CBR after thaw less than 10. (17) Frost heaving of the top portion of a fly ash embankment can be substantially decreased by the addition of moderate amounts of cement or lime. Laboratory test results have shown that unconfined compressive strength of compacted fly ash was not affected by freeze-thaw cycles, because the degree of saturation was not 100 percent, which allowed for volumetric expansion of freezing water to occur without affecting the fly ash strength. (8)Therefore, fly ash fills should be free draining. When frost susceptibility remains a concern, substituting a soil that is not susceptible to frost for fly ash within the frost zone will elevate the potential problem. The sulfate content of fly ash, particularly self-cementing ash, has caused some concern about the possibility of sulfate attack on adjacent concrete foundations or walls. Precautions that can be taken against potential sulfate attack of concrete include painting concrete faces with tar or an asphalt cement, using a waterproof membrane (such as polyethylene sheeting or tar paper), or using Type V sulfate-resistant cement in the adjacent concrete. Construction equipment needed to properly place and compact fly ash in an embankment or structural backfill includes a bulldozer for spreading the material, a compactor, either a vibrating or pneumatic tired roller, a water truck to provide water for compaction (if needed) and to control dusting, and a motor grader where final grade control is critical. Bituminous (pozzolanic) fly ash is more frequently used to construct embankments and structural backfills than subbituminous or lignite (self-cementing) fly ash. This is due in part to difficulties in placing and compacting self-cementing fly ash, which can harden almost immediately after the addition of water. Current practice is to lightly condition self-cementing fly ashes with water, allow them to stockpile for a period of time, then run the partially hardened fly ash through a primary crusher before taking it to the project site. There is a need to develop more well-defined handling and preconditioning procedures for using self-cementing fly ash as a fill material. American Coal Ash Association (ACAA). 2006 coal combustion product (CCP) production and use. Aurora, CO: American Coal Ash Association; 2007 August 24, 2007. Collins RJ, Srivastava L. Use of ash in highway construction: Delaware demonstration project. Palo Alto, California: Electric Power Research Institute; 1989. Report nr GS-6540. Baykal G, Edinçliler A, and Saygili A. Ash utilization in highways: Pennsylvania demonstration project. Palo Alto, California: Electric Power Research Institute; 1989. Report nr GS-6431. Baykal G, Edinçliler A, Saygili A. Highway embankment construction using fly ash in cold regions. Resources, Conservation and Recycling 2004 10;42(3):209-22. Gray DH; Lin Y. Engineering properties of compacted fly ash. American society of civil engineers national water resources engineering meeting, Phoenix, Arizona, American Society of Civil Engineers; 1971. Cocka E. Frost susceptibility properties of Soma-B fly ash. Journal of Energy Engineering 1997;123(1):1-10. McLaren, RJ; DiGioia AM Jr. Typical engineering properties of fly ash. Geotechnical practice for waste disposal '87 University of Michigan, Ann Arbor, Michigan: 1987. ASTM E2277-03 standard guide for design and construction of coal ash structural fills. In: Annual book of ASTM standards. ASTM, West Conshohocken, Pennsylvania: 2003. Duncan JM, Wright SG. Soil strength and slope stability. John Wiley & Sons, Inc.; 2005. DiGioia AM, Jr., McLaren RJ, Taylor LR. Fly ash structural fill handbook. Palo Alto, California: Electric Power Research Institute; 1979. Report nr EA-1281. AASHTO. Guide for design of pavement structures. Washington, DC,: American Association of State Highway and Transportation Officials; 1993. ASTM D1883-05 standard test method for CBR (california bearing ratio) of laboratory-compacted soils. In: Annual book of ASTM standards. West Conshohocken, Pennsylvania: American Society for Testing and Materials; 2005. ASTM D5918-06 standard test methods for frost heave and thaw weakening susceptibility of soils. In: Annual book of ASTM standards. ASTM, West Conshohocken, Pennsylvania; 2006. ASTM G187-05 standard test method for measurement of soil resistivity using the two-electrode soil box method. In: Annual book of ASTM standards. ASTM, West Conshohocken, Pennsylvania: 2005. Federal Highway Administration (FHWA), American Coal Ash Association (ACAA). Fly ash facts for highway engineers. Federal Highway Administration (FHWA); 2003. Report nr FHWA-IF-03-019. Kinder, DL, Morrison RE. An engineering approach for using power plant ash in a structural fill. Fifth international ash utilization symposium, report no. METC/SP-79-10U.S. Department of Energy; 1979. Fly ash is often used as a component of stabilized base and subbase mixtures. Both bituminous (pozzolanic) and subbituminous or lignite (self-cementing) fly ashes can be used. Bituminous fly ash (Class F) is used with a chemical reagent or activator, aggregate, and water. Activators such as Portland cement or lime must be added to produce a cementitious product. For most coarse graded aggregates, the amount of fly ash used will normally be in the 8 to 20 percent range. For sandy aggregates, the amount of fly ash used may be in the 15 to 30 percent range. Subbituminous or lignite fly ash (Class C), which is usually self-cementing, does not require a chemical reagent or activator. This ash is blended with aggregate and water, but because of the flash setting properties, the amount of fly ash usually is in the 5 to 20 percent range. Self-cementing fly ash can be used alone as a base course material without any aggregate. The use of fly ash in stabilized base and subbase mixtures dates back to the 1950s, when a patented base course product known as Poz-o-Pac (consisting of a blend of lime, fly ash, and aggregate) was originally developed. Since the Poz-o-Pac patents expired during the early 1970s, numerous variations of the basic lime-fly ash-aggregate formulations have evolved. There have also been stabilized base mixtures containing Portland cement that have evolved from soil-cement. All of these mixtures contain fly ash and can be described under the general heading of pozzolan-stabilized base (PSB). The major component of most stabilized base mixtures is the aggregate. Early Poz-o-Pac mixes within high traffic volume roadways used locally available high-quality crushed rock (such as limestone, trap rock, or granite), sand and gravel, or blast furnace slag. PSB mixes have been placed within haul roads, residential streets, and local roadways using power plant aggregates (bottom ash or boiler slag), marginal aggregates (including some off-spec materials), coal refuse, and reclaimed paving materials. Such alternative aggregates are often available and economical in areas where high-quality aggregate materials may be in short supply. The successful performance of PSB mixtures depends on the development of strength within the cementitious matrix formed by the pozzolanic reaction between the fly ash and the activator. This cementitious matrix acts as a binder that holds the aggregate particles together, similar in many respects to a low-strength concrete. However, unlike concrete, PSB mixtures are produced at a compactable consistency at or near optimum moisture content. According to a 2005 survey, 12 states have some type of specifications for using fly ash in transportation soil stabilization applications. (7) At least 22 states have used fly ash in stabilized base or subbase material. (8) Many of the stabilized base and subbase installations have been placed in low traffic areas such as local streets or parking lots. These installations have not usually been well documented. There are, however, a number of PSB projects that have been well reported and have provided excellent performance. At least seven states installed PSB base courses as part of the Federal Highway Administration Demonstration Project No. 59, Fly Ash Use in Highway Construction. Aside from possible adjustments to moisture content, there is little to no processing required for using fly ash in PSB mixtures. For Class F fly ash, the moisture content is dictated by the type of equipment used to produce the base course material. If a central-mix concrete plant is used, the fly ash will most likely be fed from a silo in dry form. If a pugmill mixing plant is used, the fly ash will probably be fed from a storage bin in conditioned form. If PSB materials are to be mixed in place at the jobsite, Class F fly ash will be placed and mixed in a conditioned form. Conditioned ash contains a minimal amount of water (usually 10 to 15 percent) to prevent dusting. The aggregate used in PSB mixtures should be in a saturated surface-dry condition during stockpiling. The moisture content of the aggregate should be checked prior to mixing to ensure that excess moisture has not been acquired during stockpiling. Some of the properties of fly ash that are of particular interest when fly ash is used in stabilized base applications include water solubility, moisture content, pozzolanic activity, fineness, and organic content. Consult ASTM D5239 and C593 for specifications on characterizing fly ash for use in soil stabilization. (13;14) Other properties of interest include compressive strength, flexural strength, resilient modulus, bearing strength, autogeneous healing, fatigue, freeze-thaw durability, and hydraulic conductivity. Moisture Content: If conditioned fly ash is used, the moisture content of the conditioned ash should be determined prior to mixing to confirm the moisture content is in the same range as the ash used during mix design. Fineness: Fineness requirements for stabilization of soil with Class F fly ash, which requires mixing with lime, are given in ASTM C593. (14) ASTM C593 specifies that 98 percent of the fly ash should be finer than 0.6 mm (No. 30 sieve) and 70 percent finer than 0.075 mm (No. 200 sieve). Most fly ash is capable of meeting these specifications. Bearing Strength: The California bearing ratio (CBR) test(21) is often used as a way of measuring the bearing strength of soils used in subgrades for highway and airfield pavements. Due to the relatively high strength of compacted PSB mixtures, high CBR values (in excess of 100 percent) are not unusual. Use of the CBR test is more applicable to subgrade soil stabilization with fly ash than in evaluating PSB mixtures. A wide range of aggregate sizes can be accommodated in stabilized base and subbase mixtures. After determining the particle size distribution of the aggregate in a PSB mixture, the initial step in determining the mix proportions is to find the optimum fines content. This is done by progressively increasing the quantity of fines (consisting of fly ash plus activator) and making density determinations for the blends of aggregate and fines. Estimated optimum moisture content is selected and held constant for each blend. Each blend of aggregate and fines is compacted into a Proctor mold using standard compaction procedures. At least three such blends are required and five blends are recommended. Dry density versus fines content is plotted and this procedure is used to identify the percentage of fines (expressed as a percentage by dry weight of the total mixture) that results in the highest compacted dry density. The optimum fines content selected by this procedure should be 2 percent higher than the fines content at the maximum dry density. The optimum moisture content must then be determined for this mix design proportions. To determine the most suitable proportion of activator to fly ash, five different mix combinations should be evaluated at the optimum moisture content. The typical range of activator to fly ash ratios is 1:3 to 1:5 when using lime or Portland cement. The typical range of kiln dust to fly ash ratios is in the range of 1:1 to 1:2. If fly ash used in a PSB mixture is mixed in a dry form, the fly ash should be stored in a silo or pneumatic tanker. If conditioned fly ash (usually Class F fly ash) is used, then the conditioned fly ash can be stockpiled. When fly ash is stockpiled for an extended period of time in dry or windy weather, the stockpile may need to be periodically moistened to prevent unwanted dusting. The blending or mixing of PSB materials can be accomplished either in a mixing plant or in-place. Plant mixing provides greater control over the quantities of materials batched, which results in a uniform PSB mixture. Blending of PSB ingredients in a mixing plant can occur in discrete batches or by continuous mixing. Pugmill mixing plants blend accurately controlled amounts of aggregate, fly ash, activator, and water in batches in a mixing chamber, usually for periods of 30 to 45 seconds. Pugmill mixing plants can be used with properly calibrated field conveyors from bins or silos for a continuous mixing operation. Rotating drum mixers have been used for blending PSB materials in batches. (30) Plant-mixed materials should be delivered to the job site as soon as possible after mixing. Alternatively, in-place mixing can be used for cold in-place recycling (CIR) of asphalt pavement. On site mixing does not require the establishment of a mixing plant and also takes advantage of the rapid set time of self-cementing fly ash. (31) Although mix-in-place typically does not result in an accurately proportioned mix, mix-in-place still produces high-quality PSB material. The various components of the PSB mixture are delivered, spread on the road site, and mixed in place using a pulvamixer or construction disc. Delivery of PSB material is typically handled by covered end-dump vehicles. The same equipment used for spreading plant-mixed PSB material can be used for mix-in-place material. Once the PSB material is dumped, spreading is usually accomplished by a bulldozer or a motor grader. However, plant-mixed material can also be spread to a more uniform and accurate loose thickness by a spreader box or a paving machine. PSB material should be as close as possible to optimum moisture content when placed. During the in-place mixing operation, fly ash should be placed on the roadway first, either directly on a prepared subgrade, or above a layer of aggregate, if the PSB mixture contains aggregate. Fly ash is usually applied in a conditioned form to minimize dusting. The activator is then placed on top of the fly ash, usually in a dry condition, although lime can also be applied in a slurry form. The materials are then mixed together by means of a rotary mixer. After placement and compaction of the PSB material, the material should be properly protected against drying to assist in the development of in-place strength. Water can be periodically applied between lifts or before application of a wearing surface. If an asphalt concrete pavement is to be placed as an overlay, an asphalt emulsion seal coat should be applied to the top surface of the base or subbase within 24 hours of pavement placement. The exact type of emulsion, rate of application, and temperature of the asphalt must be in compliance with applicable specifications. The performance of pavement systems incorporating PSB material depends on the development of in-place strength following placement, compaction, and curing. Depending on the anticipated traffic loadings, an analysis of when traffic can be permitted to travel on the base material may be necessary to avoid potential fatigue damage due to early overloading. Unless an asphalt surface or binder course has been placed over the PSB material, vehicles should not be permitted on the PSB layer until achieving an in place compressive strength of at least 2410 kPa (350 lb/in2). Based on laboratory testing for strength development, the time to achieve this strength can be determined. Ordinarily, placement of asphalt paving over the PSB material is recommended within 7 days after the PSB material has been placed. (12) If a Portland cement concrete pavement is constructed over the PSB layer, a waiting period of 7 days is also recommended. A low percentage of water, in the range of 10 to 25 percent by weight of ash, is sufficient to reduce dusting and can be added at the mixing plant. The additional water that is required for proper compaction of the PSB material can be applied in place at the construction site before compaction. Thomas T, Kadrmas A, Huffman J. Cold in-place recycling on US-283 in Kansas. Transportation Research Record 2000;1723(1):53-6. Crovetti JA. Construction and performance of fly ash-stabilized cold in-place recycled asphalt pavement in Wisconsin. Transportation Research Record 2000;1730:161-6. Ramme BW, Tharaniyil M. Coal combustion products utilization handbook. We Energies, Milwaukee, WI; 2004. Wen H, Tharaniyil M, Ramme BW. Investigation of performance of asphalt pavement with fly-ash stabilized cold in-place recycled base course. Transportation Research Record 2003;1819(1):27-31. Li L, Benson CH, Edil TB, Hatipoglu B. Sustainable construction case history: Fly ash stabilization of recycled asphalt pavement material. Geotechnical and Geological Engineering, An International Journal, 2007. Trzebiatowski BD, Edil TB, Benson CH. Case study of subgrade stabilization using fly ash: State highway 32, Port Washington, Wisconsin. In: Beneficial reuse of waste materials in geotechnical and transportation applications. A. Aydileck, J. Wartman, editors, ASCE Reston, VA: ; 2004. Senol A, Edil TB, Bin-Shafique MS, Acosta HA, Benson CH. Soft subgrades' stabilization by using various fly ashes, Resources, Conservation and Recycling 2006;46:365-76. American Coal Ash Association (ACAA). Flexible pavement manual: Recommended practice - coal fly ash in pozzolanic stabilized mixtures for flexible pavement systems. 1991:128 p.
ASTM D5239-04 standard practice for characterizing fly ash for use in soil stabilization. In: Annual book of ASTM standards. ASTM, West Conshohocken, Pennsylvania: 2004. ASTM C593-06 standard specification for fly ash and other pozzolans for use with lime for soil stabilization. In: Annual book of ASTM standards, ASTM; West Conshohocken, Pennsylvania: 2006. Portland Cement Association (PCA). Soil-cement laboratory handbook. PCA, Skokie, Illinois: 1992. Meyers JF, Pichumani R, Kapples BS. Fly ash: A highway construction material. Federal Highway Administration (FHWA); Washington, DC: 1976. Report nr FHWA-IP-76-16. ASTM D1883-05 standard test method for CBR (California bearing ratio) of laboratory-compacted soils. In: Annual book of ASTM standards. ASTM, West Conshohocken, Pennsylvania: 2005. Ferguson G. Use of self-cementing fly ashes as a soil stabilization agent. In: Fly ash for soil improvement. American Society for Civil Engineers; 1993. Little DN, Males EH, Prusinski JR, Stewart B. Cementitious stabilization. In: Transportation in the new millennium: State of the art and future directions, perspectives from TRB standing committees. Transportation Research Board, National Research Council; Washington, DC: 2000. Sawangsuriva A, Edil TB. Evaluating stiffness and strength of pavement materials. In: Proceedings of the institution of civil engineers. Vol.158, GE4, 2005. 217-230. Ahlberg HL, Barenberg EJ. Pozzolanic pavements. Urbana, Illinois: University of Illinois, Engineering Experiment Station; 1965 February. Report nr 473. ASTM D560-03 standard test methods for freezing and thawing compacted soil-cement mixtures. In: Annual book of ASTM standards. ASTM, West Conshohocken, Pennsylvania; 2003. Cross S, Young D. Evaluation of type C fly ash in cold in-place recycling. Transportation Research Record 1997;1583(1):82-90. AASHTO. Guide for design of pavement structures. American Association of State Highway and Transportation Officials; Washington, DC, 1993. American Coal Ash Association (ACAA). Soil stabilization and pavement recycling with self-cementing coal fly ash. American Coal Ash Association; Aurora, CO: 2006. Barenberg EJ, Thompson MR. Lime-fly ash stabilized bases and subbases. National Cooperative Highway Research Program Synthesis of Highway Practice 37, Transportation Research Board; Washington, DC: 1976. White DJ, Harrington D, Thomas Z. Fly ash soil stabilization for non-uniform subgrade soils, Volume I: Engineering properties and construction guidelines. Iowa State University, Ames, IA: Center for Transportation Research and Education, Iowa State University; 2005. Thornton SI, Parker DG. Construction procedures using self-hardening fly ash. Federal Highway Administration, Washington, DC: 1980. Report nr FHWA/AR/80, 004. Shirazi H. Field and laboratory evaluation of the use of lime fly ash to replace soil cement as a base course. Transportation Research Record 1999;1652(1):270-5. Gray DH, Tons E, Thiruvengadam TR. Performance evaluation of a cement-stabilized fly ash base. Transportation Research Record 1994;1440. Environmental Protection Agency (EPA), Federal Highway Administration (FHWA). Using coal ash in highway construction - A guide to benefits and impacts. ; April 2005. Report nr EPA-530-K-002:ID: 151. Li L, Benson CH, Edil TB, Hatipoglu B. Groundwater impacts from coal ash in highways. Waste and Management Resources, November 2006;159(WR4):151-63. Coal fly ash can be used as a component in the production of flowable fill (also called controlled low strength material or CLSM), which is used as a self-leveling, self-compacting backfill material in lieu of compacted earth or granular fill. Flowable fill mixtures include filler material, cementitious material, and can contain mineral admixtures. Filler material usually consists of fine aggregate such as sand, but some flowable fill mixes may contain equal portions of coarse and fine aggregates. (1) Fly ash has been used as a replacement of partial replacement for all three constituents in flowable fill. The use of flowable fill as a highway construction material is becoming more widespread throughout the United States. Most state transportation agencies have used flowable fill mainly as a trench backfill for storm drainage and utility lines on street and highway projects. Other applications for flowable fill include filling behind retaining walls, building excavations, underground storage tanks, abandoned sewers and utility lines, and slab jacking. Flowable fill is considered a controlled low strength material (CLSM) according to ACI 116R as long as the compressive strength is less than 8270 kPa (1200 lb/in2). (2;3;4) In high strength CLSM applications, the strength of flowable fill mixes can range from 1380 to 8270 kPa (200 to 1200 lb/in2), depending on the design requirements of the project in question. The desired range of compressive strength in flowable fill mixtures depends on whether the hardened material may have to be removed in the future. The ultimate strength for excavatable flowable fill should not exceed 1035 kPa (150 lb/in2) or jack hammers may be required for removal. (1) For flowable fill mixes used in higher bearing capacity applications, such as structural fill or temporary support of traffic loads, higher compressive strengths can be designed. Since flowable fill is normally a comparatively low-strength material, there are no strict quality requirements for fly ash used in flowable fill mixtures. Fly ash is well suited for use in flowable fill mixtures. The fine particle size (nonplastic silt) and spherical particle shape enhances mix flowability. The pozzolanic or cementitious properties of fly ash allow for lower cement content than would normally be required to achieve equivalent strengths. Fly ash used in flowable fill does not have to meet strict specification requirements, such as ASTM C618 for use in concrete. (7;9) A high-quality source of ash is not required and fly ash with high LOI or carbon content is suitable. (7) High carbon content can be a concern with concretes containing air-entrainment where entraining admixtures are more susceptible to absorption. Since CLSM does not often have requirements for air content, carbon content does not affect the properties. (4) Dry or conditioned fly ash as well as reclaimed ash from settling ponds may also be suitable for flowable fill. No special processing is necessary prior to use. Pozzolanic-type fly ash can be introduced into flowable fill mixes in either a dry or moistened condition. Self-cementing fly ash should be introduced into flowable fill mixes in a dry condition to avoid presetting. Engineering properties of flowable fill mixes that are of interest include compressive strength, flowability, stability, bearing capacity, modulus of subgrade reaction, lateral pressure, time of set, bleeding and shrinkage, density, and hydraulic conductivity. The properties of fly ash that are the most influential to the performance of flowable fill mixtures are the spherical particle shape and pozzolanic activity with Portland cement. Flowability: Flowability or fluidity is a measure of how well a mixture will flow when being placed. Mixes with higher water content are more flowable. (7) Flowability can vary from stiff to fluid depending on the job requirements. Flowability can be measured using a standard concrete slump cone, a flow cone, or a modified flow test using an open ended 75 mm (3 in) diameter by 150 mm (6 in) high cylinder. (10;11;12) Flowability ranges associated with the standard concrete slump cone (ASTM C143) generally vary from 150 mm (6 in) to 200 mm (8 in). (10) Admixtures (such as water reducing agents) are not normally used in flowable fill. For high fly ash content mixes, the slump ranges can be expected to be at least 25 to 50 mm (1 to 2 in) higher than low fly ash content mixes at comparable moisture contents. California Bearing Ratio (CBR) is a measure of the bearing strength of subgrade. Flowable fill has shown CBR ranging from 40 to 90 percent. (15;16)CBR testing of typical 690 kPa (100 lb/in2) flowable fill resulted in a CBR value of 50 within 24 hours of placement. As the compressive strength of the flowable fill material increases, the CBR can be expected to increase. Lateral Pressure: Because of lateral fluid pressure at the time of placement, flowable fill installations at depths in excess of 1.8 m (6 ft) are normally placed in separate lifts, with each lift not exceeding 1.2 to 1.5 m (4 to 5 ft). (18) Once flowable fill has hardened, the lateral pressure is reduced. Bleeding and Shrinkage: High fly ash content flowable fill mixes with relatively high water contents (250 mm (10 in) slump) tend to bleed water prior to initial set. Evaporation of the bleed water often results in shrinkage of approximately one percent of flowable fill depth. The shrinkage may occur laterally as well as vertically. No additional shrinkage or long-term settlement of flowable fill occurs once the material has reached an initial set. (7) Low fly ash content mixes, because of their high fine aggregate content and ability to more readily drain water through the flowable fill, tend to exhibit less bleeding and shrinkage than high fly ash content mixes. Structural design procedures for flowable fill materials are no different than geotechnical design procedures used for conventional earth backfill materials. The procedures are based on using the unit weight and shear strength of the flowable fill to calculate the bearing capacity and lateral pressure of the material under given site conditions. If fly ash is to be added in a dry form (usually in low fly ash content mixes) the fly ash should be stored in a silo or pneumatic tanker. Fly ash (usually Class F fly ash) in a conditioned form in high fly ash content mixes can be stockpiled. If fly ash is stockpiled for an extended period in dry or windy weather conditions, the stockpile may need to be periodically moistened to prevent dusting. Flowable fills can be batched and mixed in pugmills, turbine mixers and central-mix concrete plants. High fly ash content flowable fill mixes have been mixed in rotary-mix concrete trucks or in mobile-mix vehicles. Batching and mixing in individual mobile-mix vehicles is usually done only when small quantities of flowable fill are required at a particular location. Under such circumstances, attaining a uniform distribution of cement throughout the mix may be difficult. Central-mix concrete plants work especially well with low fly ash content mixes, in which a high percentage of sand is used. The flowable fill mix is batched as a regular concrete mix without any coarse aggregate. Pugmills are well suited for mixes prepared with ponded or conditioned ash. A second feed bin can be added to a pugmill if sand (or other filler) is used. Flowable fill materials are most commonly transported to the site and discharged using rotary-mix concrete trucks. However, flowable fill may also be placed by pumps, conveyors, chutes, boxes, buckets, tremie, or in any way that concrete can be placed. Flowable fill requires no compaction or vibration following placement. For placement of relatively deep backfills behind abutments or retaining walls, several lifts or layers are recommended. This limits the amount of lateral pressure exerted by the flowable fill and also prevents excessive heat of hydration, especially if self-cementing fly ash is used. (18) When flowable fill is used to backfill pipe trenches, some lighter-weight pipes, such as corrugated metal pipes, will have to be restrained to prevent floating as the flowable fill is placed. Flowable fill can be placed in flowing or ponded water because the fill will displace the water, thus eliminating the need for pumping prior to placement. There are normally no requirements for the curing of flowable fill, although during periods of hot weather, covering the exposed surfaces of flowable fills is advised to minimize evaporation and shrinkage cracking. Temperatures within the flowable fill in excess of 90° to 100°F (32° to 38°C) are considered excessive. A quality assurance program is recommended to monitor the consistency, properties, and performance of flowable fill. As a minimum, such a program should consist of initial mix design testing, determination of key mix properties (such as strength development, flowability, setting time and density), and field testing of these properties, with flowability considered the most important quality control parameter to be monitored in the field prior to placement of the material. Smith A. Controlled low-strength material. Concrete Construction 1991:389-98. ACI Committee 116. Cement and concrete terminology. Detroit, Michigan: American Concrete Institute (ACI); 2000. Report nr 116R-00. ACI Committee 229. Controlled low strength materials (CLSM). Detroit, Michigan: American Concrete Institute (ACI); 1999. Report nr 229R-99. Ramme BW, Tharaniyil M. Coal combustion products utilization handbook. Milwaukee, WI: We Energies; 2004. Pierce CE, Blackwell MC. Potential of scrap tire rubber as lightweight aggregate in flowable fill. Waste Management 2003;23(3):197-208. Collins RJ; Tyson SS. Utilization of coal ash in flowable fill applications. Symposium on recovery and effective reuse of discarded materials and by-products for construction of highway facilities, Federal Highway Administration; 1993. Hennis KW; Frishette CW. A new era in control density fill. Tenth international ash utilization symposium, Palo Alto, California: Electric Power Research Institute; 1993. ASTM C143/C143M-05a standard test method for slump of hydraulic-cement concrete. In: Annual book of ASTM standards. ASTM, West Conshohocken, Pennsylvania: 2005. ASTM C939-02 standard test method for flow of grout for preplaced-aggregate concrete (flow cone method. In: Annual book of ASTM standards. ASTM, West Conshohocken, Pennsylvania: 2002. Balsamo NJ. Slurry backfills – useful and versatile. Public Works 1987 April;118:58-60. ASTM D6103-04 standard test method for flow consistency of controlled low strength material (CLSM). In: ASTM; Annual Book of ASTM Standards, ASTM, West Conshohocken, Pennsylvania: 2007. Masada T, Sargand SM. Construction of flexible pipe system using controlled low strength material - controlled density fill (CLSM-CDF). Columbus, OH: Ohio Department of Transportation; 2001 September. Report nr FHWA/OH-2001/08. American Stone-Mix I. Physical properties of FLO-ASH. 2000. Brewer & Associates. Load transfer comparisons between conventionally backfilled roadway trenches and those backfilled with controlled low strength material -- controlled density fill (CLSM-CDF). Cincinnati, Ohio: Cincinnati Gas & Electric Company; 1991. Krell, WC. Flowable fly ash. 68th annual meeting of the transportation research board; Washington, DC: Transportation Research Board; 1989. Newman FB, Rojas-Gonzales LF, Knott DL. Current practice in design and use of flowable backfills for highway and bridge construction. Harrisburg, Pennsylvania: Pennsylvania Department of Transportation; 1992. Report nr 90-12. Katz A, Kovler K. Utilization of industrial by-products for the production of controlled low strength materials (CLSM). Waste Management 2004;24(5):501-12. ASTM D6024-02 standard test method for ball drop on controlled low strength material (CLSM) to determine suitability for load application. In: Annual book of ASTM standards. ASTM, West Conshohocken, Pennsylvania; 2002. Chugh YP, Chaudhuri SK, Wilcox H, Sengupta S, Jennings J. Coal combustion residues management projects. Carterville, IL: Illinois Clean Coal Institute; 1998. Report nr 97-1/3.4A-2. Glogowski PE, Kelly JM, Brendel GF. Laboratory testing of fly ash slurry. Palo Alto, California: Electric Power Research Institute; 1988. Report nr CS-5100. Gabr MA, Bowders JJ. Controlled low-strength material using fly ash and AMD sludge. Journal of Hazardous Materials 2000 9/15;76(2-3):251-63. Doven AG, Pekrioglu A. Material properties of high volume fly ash cement paste structural fill. J Mater Civ Eng 2005;17:686-93. ASTM D4832-02 standard test method for preparation and testing of controlled low strength material (CLSM) test cylinders. In: Annual book of ASTM standards. ASTM, West Conshohocken, Pennsylvania: 2002. Collins RJ, Ciesielski SK. Recycling and use of waste materials and by-products in highway construction. National Cooperative Highway Research Program Synthesis of Highway Practice 199. Transportation Research Board; Washington, DC: 1994. Naik TR, Singh SS, Ramme BW. Performance and leaching assessment of flowable slurry. J Environ Eng 2001;127(4):359-68. Gaddam R, Inyang HI, Young DT, Umoh E. An economic feasibility model for ash use in flowable fill with integration of logistics and contaminant leaching factors. International Journal of Environment and Waste Management 2006;1(1):20-38. Türkel S. Long-term compressive strength and some other properties of controlled low strength materials made with pozzolanic cement and class C fly ash. Journal of Hazardous Materials 2006 9/1;137(1):261-6.